I made you some 4 Ingredient Macaroons! I keep seeing all these macaroon-like raw snack showing up at the health food stores. Well all of them are pretty pricey. Like over $6 for a bag of maybe 7-8 snacks! Well I made these healthier vegan macaroons for much cheaper than that. They best part? They take only a few minutes to make! If you like recipes with few ingredients, you may also enjoy this post. They also contain ZERO refined sugar. 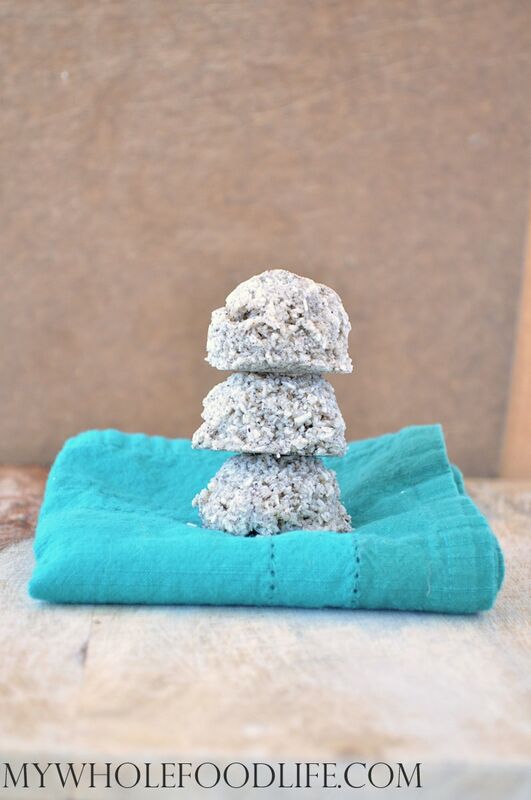 Not only are these 4 Ingredient Macaroons super easy to make, but they are also vegan, gluten free and paleo. If you wanted to, you could drizzle a little melted chocolate over them. My 3 Ingredient Chocolate Bar recipe would be great for that. 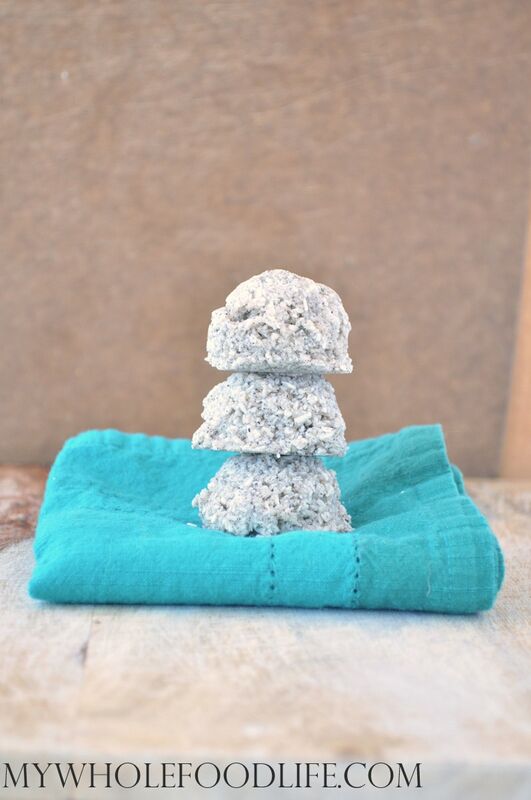 All you need is 4 simple ingredients to make this healthier recipe! Use a cookie scoop to form macaroons and place on a lined baking sheet . The mixture will be loose, but I promise it forms right up in the fridge. Place in the fridge to set. Should only take a few minutes. Keep these in the fridge or freezer. They should last a few weeks! Enjoy! What an easy fun recipe! Love how simple it is. 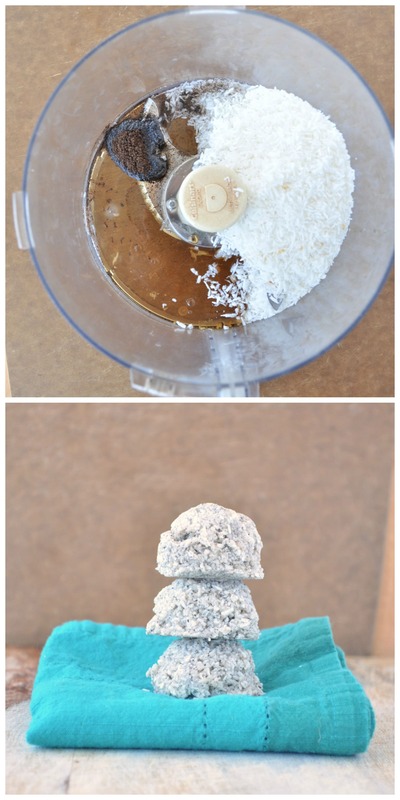 I love macaroons, and will have to try this! I just discovered your site as I am planning for a new adventure with food to feel better! Anyway...I'm not a fan of maple syrup in a lot of things. Do you have a good substitute? Do you like honey? That would work too. I love the idea of only 4 ingredients and 5 minutes to make. Can't beat it. Macaroons are the best, coconut being mine and the girls favorite! Better still, my husband (and I find a lot of men put themselves into this category) think they don't like coconut when they really do. So maybe these will last more than a day! Hello, do you think I could use another oil?like olive oil? I am not sure if olive oil will work. If you try, I would love to know the results. Is there a substitute for coconut oil in general? I love coconut but for some reason not the flavor of coconut oil. And it seems to be used as a binder in so many no bake recipes. I used it as a binder in this recipe. Maybe you can use a few dates to bind instead? No, EVOO won't work because it does not harden in the frig. The only sub I can think of is butter, which, like coconut oil, is soft at room temp, but gets hard when cold. can i use vanilla extract instead vanilla beans? You can, but you will taste the alcohol since this is not baked. Oh good to know that exists! I have a vanilla bean, but how do you grind them? Do you put the whole thing in to grind? Thank you! I will do that. Then I'll have to look for some ground vanilla beans for the next time. Oh, and it would be cool to add some chia and hemp seeds! Yummy and easy to make. Thank you for sharing good-for-us recipes! Hi what hwalthysubstitute for vanilla beans could you suggest? You can try using an alcohol free vanilla extract. These macaroons are lovely. Unfortunately I couldn't get them to stick together. I tried an extra tablespoon of coconut oil, water on my hands.... it just wasn't happening. So, I packed them into a 8x8" pan and voila! I did however use dessicated coconut as it was what I had on hand, maybe that was my issue? However, I cut them into bars and stored them in the freezer... we finished them off this evening with our tea. Thanks ever so much, I'll make these again and again. I am so glad you enjoyed them, but sorry they didn't stick together for you. You can use extract, but you may taste the alcohol since these are not baked.